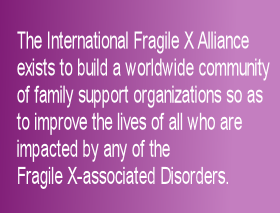 Fragile X Syndrome (FXS), is the most common, known inherited form of intellectual and learning disabilities, and affects approximately two million people worldwide. Many, if not most, with the syndrome remain undiagnosed. Together with Fragile X-associated Tremor/Ataxia Syndrome (FXTAS) and Fragile X-associated Primary Ovarian Insufficiency (FXPOI), which result from the genetic premutation, over 20 million men and women worldwide are affected or at risk for developing a Fragile X-associated Disorder (FXD).